The United States lifted a ban on laptops in cabins on flights from Abu Dhabi to the US, saying the United Arab Emirates’ Etihad Airways had put tighter security measures in place as required. 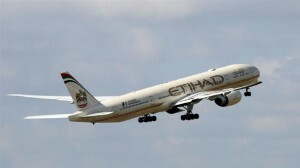 Etihad Airways welcomed the decision, and credited a preclearance facility at Abu Dhabi International Airport – where passengers clear US immigration before they land in the United States – for “superior security advantages” that had allowed it to satisfy US requirements. Homeland Security spokesman David Lapan said US officials had already seen that “the measures have been implemented correctly and to the full extent required” in Abu Dhabi. He said American monitors would make further visits to ensure the checks were being done properly. “The enhanced security measures, both seen and unseen, include enhanced screening of passengers and electronic devices,” Lapan said, declining to elaborate. Etihad is the only airline that operates direct flights from Abu Dhabi to the United States – a total of 45 flights a week. The US ban – first announced in March as a security measure over fears that bombs could be concealed in electronic devices taken aboard aircraft - now applies to nonstop US-bound flights from nine international airports in Amman, Jordan; Kuwait City; Cairo; Istanbul; Jeddah and Riyadh, Saudi Arabia; Casablanca, Morocco; Doha, Qatar; and Dubai in the UAE. In late May, Homeland Security Secretary John Kelly said he was considering banning laptops from the passenger cabins of all international flights to and from the US. Kelly’s comments came after US President Donald Trump shared highly classified intelligence about the Islamic State of Iraq and the Levant (ISIL, also known as ISIS) group wanting to use laptops to target aircraft with senior Russian officials visiting the White House. The laptop ban, as well as a Trump administration travel ban on six predominantly Muslim countries, has hurt Gulf carriers. Dubai-based Emirates has slashed 20 percent of its flights to America in the wake of those decisions. The airline also has been trying to get the laptop ban lifted for its direct flights to the US.